Rando Editions publishes maps and hiking guides. Walking at any age is the easiest, most natural, and most beautiful way of reaching your destination via the countryside. Pyrenees, Alps, Brittany, Provence, Alsace, Aquitane.... not forgetting Normandy, Riviera, Franche-Comte, Ile de France (etc). In many regions of France RANDO celebrates the art of walking in nature, and also the grace and imagination of urban routes. Furthermore this publisher invites you to follow in the tracks of the pilgrims to Compostella, in a spirit of discovery. Guides to the various routes of the Way of St. James across France. Written in accessible, easy to follow French, the guides provide all the essential practical information and full details of various types of accommodation along the route, including gîtes d'étape and campsites. The routes are divided into daily sections of various lengths according to the difficulty of the terrain, usually from four to eight hours of walking, with brief descriptions or instructions at numerous points along each section. The accompanying maps are easy to follow and provide a clear picture of the route. The guides also include descriptions of all the important historical monuments along each route, illustrated with colour photographs. 360° opening - thanks to its spiral - including original maps and profiles of the runs allowing a quick read of the routes, combining a profound description and a rich iconography, this collection is the reference for ramblers in the Pyrenees and Alps of today. Four levels of routes, clearly defined by a self-portrait: stroller, walker, hiker, experienced hiker. 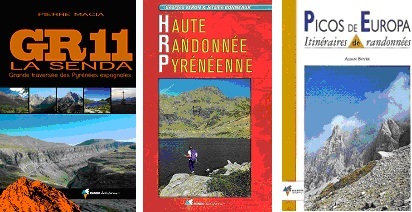 GR11 long-distance footpaths along the Spanish side of the Pyrenees in a French language guide from Rando Editions. The guide divides the route into 40 sections and covers it from the Mediterranean, starting at Cap de Creus on the Costa Brava, to the Atlantic, ending at Cabo Higuer. Descriptions of each sections are subdivided into paragraphs covering usually 15 to 30 min. of walking and are accompanied by a panel summarizing the distance, duration and the change in elevation, possible difficulties, and general comments on availability of accommodation and restaurants/food outlets. All the chapters are illustrated with numerous colour photos. The "Haute Randonnée Pyreneenne" footpath runs from the Atlantic to the Mediterranean. The guide describes the trail in 41 stages. This route is the most prestigious cross borders path along mountainous areas and therefore intended only for experienced hikers in the mountains. The "Picos de Europa" are situated at the west of the Cantabrian Mountains, partly on the grounds of the Covadonga National Park and are formed by the mountains of Cornión, Los Uriel and the Sierra de Andara. It is a rugged mountain with beautiful green fields. Selection of 14 routes and tourist information. 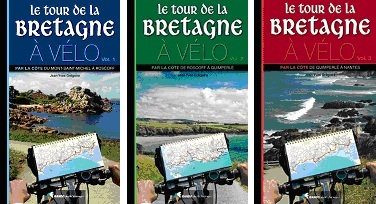 The coastal cycling route around Brittany on three spiral-bound atlases from Rando Editions, with maps overprinted with the route, detailed instructions, information on accommodation facilities and descriptions of places of interest. Each guide divides the route into daily stages and shows it overprinted on basic colored maps at approximately 1:100,000 to 1:80,000. The guides also provide several accommodation alternatives for each stage, with full contact details. Description of places of interest any accompanied by many colour photos. The TREK Mont Blanc: in 11 stages around the massif. The Mont-Blanc is an invitation to travel. Vertical climbing, of course, with its high peaks, but also cross-border walking to discover all its aspects by making the turn. Beyond the traditional Tour du Mont Blanc, there are a multitude of variations. One proposed in this guide is divided into 11 stages and stands for more than 14 000 m difference in altitude, what makes the trekking only reserved for well trained hikers knowing the constraints of the high mountains. 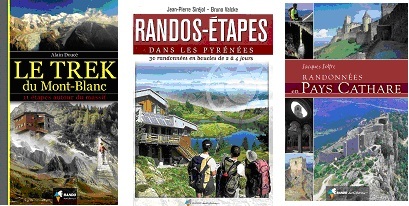 "Randos-Etapes dans les Pyrénées" is a glossy, high quality hardback with 30 best hiking circuits from two to four days long, mainly on the French side, but with a few route cross-border or in Spain. This book is ideal for planning a vacation experience that combines the area by car with walking tours through its remote areas. "Randonnées and Cathar": This book is both a tourist discovery describing 11 major sites where the Cathars lived and have objected to the armies of the Inquisition (Montsegur, Peyrepertuse, Quéribus, Lastours Puilaurens, Minerva, etc.). as a hiking guide for day or half-daily stages in the area. Forty routes are described in detail throughout the departments of Ariège and the Aude in the first place, but also in the eastern Pyrenees and the Hérault.